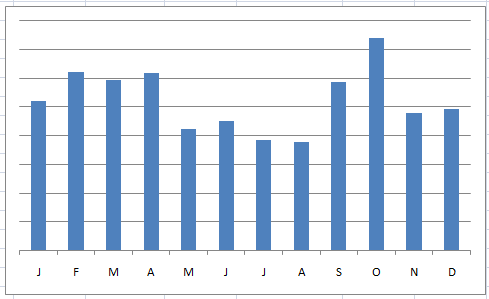 As you can see, I have a trough of sales every summer and a spike in October, among other seasonal anomalies. More about why that is later. This is just the sales graph, but almost any other statistic for my business — page views, signups, ad impressions, search traffic, etc etc — more or less tracks this curve, although that isn’t going to be the case for all businesses. When people stop buying what you sell, you’ll tend to have less money. That sounds vacuous, but it has important implications for your cash management. It means that you’ll need to model your behavior on the ant, not the grasshopper: when times are easy, save up for when times are going to be difficult. There are other options besides just banking money made during the on-season. For many businesses, support loads, marketing activities, and the like all roughly coincide with the level of sales. The number of emails I send regarding Bingo Card Creator falls by roughly 80% during the summer months. This frees up a lot of time and focus in your organization. One option to keep the lights on for software businesses is to do consulting or similar billable work during the off-season and go back to the product during the on-season — I took advantage of that this summer, to avoid breaking the piggybank too badly. Another option, very popular among offline businesses but not used much online, is to do seasonal sales. For example, if you sell software to teachers, you could do a back to school sale in August and, essentially, cut three weeks off of summer. I did a 20% discount one year from late July through mid-August, which helped cushion the blow a bit. Many SaaS startups are currently scratching their heads wondering “Why does this matter?”, because they get consistent revenue on a monthly basis regardless of when the customer’s signup was, and hence can’t conceive of having a growing user population and falling revenues. This is yet another enviable reason to sell software on a subscription basis. Deploying new features, particularly ones which involve significant engineering changes (like wholescale site redesigns or business model changes), gets much easier when 80% of the user population is not actually on the site. In the event you have an issue, the number of people affected by it is likely to be much smaller, and you’ll have a few months to get the kinks out prior to sales hitting their peaks again. When I released the online version of my software last year, conversion rates plunged by about 30% while I was getting debugging the software and (more importantly, as it turns out) the marketing message. Since it was the dog days of summer, though, that didn’t end up costing me all that much money (although it was a sock in the gut to have my first year-over-year decline ever). 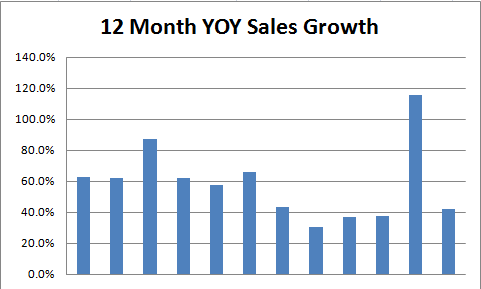 To the extent that outside parties do not understand the seasonality in your market, you need to educate them. Investors, for example, might assume if they come from a non-seasonal background that any dip in the “up and to the right” story means you are losing traction. It is a virtual certainty, for example, that GroupOn is going to sell less coupons in January than they will in December. Having an article on TechCrunch saying “Groupon Growth Finally Puttering Out?” would not be positive for them (well, to the extent that TechCrunch coverage matters to a profitable business…). 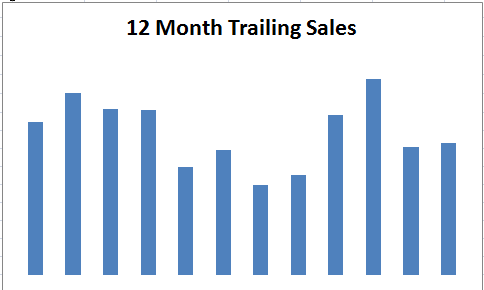 The first business looks like it has had mostly flat sales for the last year, and a recent slump. The second business looks like it is killing it. They are the same business. In the rather unlikely scenario that I was seeking investors, I know which of these two graphs I’d put in my slide deck. When I was young and stupid, I started planning for Halloween in October. That works very poorly for Internet marketing: it will take months for your holiday-specific content (such as my page about Halloween bingo cards) to start ranking in the search engines where you want it to be. If you do AdWords advertising, starting a campaign right before a holiday is likely going to be disastrous, because a) if it gets plunged into approval purgatory you just missed your holiday (this has happened to me quite frequently) and b) your campaign won’t have time to build up the positive history which will get it the widest exposure and best costs. If you have another facet of this you’d like covered, or if you have some tactics which have worked for you, I’d love to hear about them in the comments. Some months ago when the 99designs fixed-price logo store launched, my buddy Thomas at Matasano remarked that it would have been the perfect choice for my business. I said that, while I’m quite impressed with 99designs’ business model and many of the logos on offer, I thought the less-generic-looking logo which I had custom-made fairly cheaply (by the folks at Logo Samurai — I bought three logos and chucked the two I liked least) was better than a generic logo. Thomas disagreed, and said that the more “professional” look of the off-the-rack logos would offset the genericness.